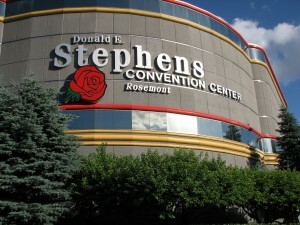 Saturday I took the trip down to the beautiful Rosemont convention center in Des Plaines, Illinois for the Flames Rising webzine I’m project manager for. I had the opportunity to talk with artists, publishers, vendors and many, different folk excited about the comic book industry. 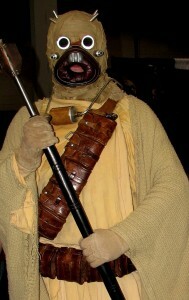 This was my first comic book convention, and I have to say that I was very impressed with how nice everyone was. I did a full write-up of the con through this article on Flames Rising, “Impressions of Wizard World 2008.” Additionally, I asked a few of the artists I had met to write some guest blog posts on topics related to our universe: first convention appearance, copyright and image rights, etc. If you have something you’d like to know about hiring artists or working with them, feel free to contact me with your questions and I’ll feature them on my blog. The artists I met were very enthusiastic and dedicated to the concept of working within a community; I’m sure that one of them would be happy to answer anything you might want to know. My next big convention will be at GenCon Indianapolis where I will be working the Abstract Nova booth. Fortunately, this company is really great to work with and understands that my day job comes first. In my reflections of a gaming industry freelancer, I had talked about some of the positive and negative experiences I’ve had in the industry. My first writing credit in the gaming industry was through this company, and I’m happy to support its efforts to grow. This week is going to be a bit on the light side for posting: I just had two, really great pieces of news come through the pipe and my deadline for the last novella is looming. With a shorter workweek due to the July 4th holiday, things are extremely busy in my world. The two that I have in the hopper do continue the discussion about getting published and where to look: thank you to everyone who provided quotes for my upcoming posts. I will get to those posts as soon as I can. Happy scribing and please, don’t forget to write! From Email: How do I get Published? How do I Figure out if my Writing is Worth the Trouble? After I read his email, I sat back in my chair and hit my head. You see, I interpreted his question as a multi-layered one, that had several meanings. First, Thomas (who professionally writes white papers, articles, etc.) reminded me of the many writers out there who might stop themselves from submitting a different style of writing because they’re unclear of what their writing is worth. Second, he wanted to know what the process was for submitting work was and if it was worth the trouble. Folks, I have a rare treat for you. Today I’d like to give the floor to freelance reporter Chris Welch, who has been covering the flooding in the state of Wisconsin. I had met Chris at a science fiction convention in Madison called OddCon where we were speaking on some of the same panels. Chris is the sort of guy that you’d like to hang around; he’s very personable and loves to write and speak about writing. In his first-ever blog post, Chris speaks from the heart, talking about what it’s like being a freelance reporter when a tragedy like the Wisconsin flooding occurs. That statement, a frustration voiced by a Fort Atkinson resident about his flooded neighborhood, also provided a concise reason why writers like us write. I’d like to thank Monica for the opportunity to guest-blog here. “Words on the Water” seems the most fitting place to blog on writing about floods and the stories surrounding those floods. My usual beat is Whitewater, Wisconsin. 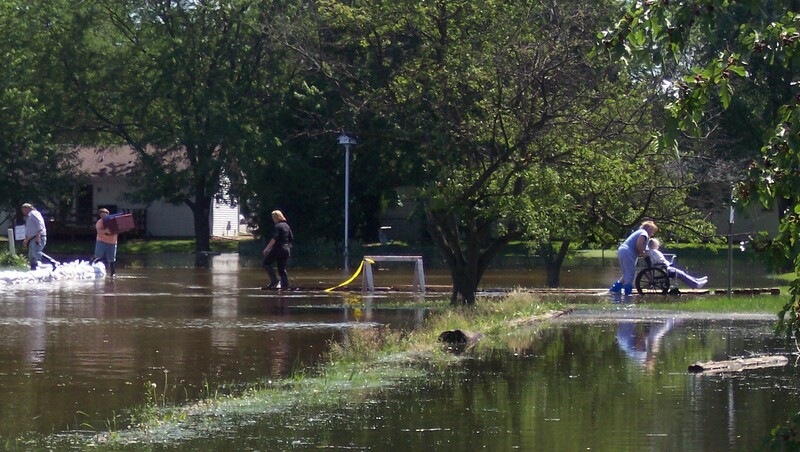 It was spared major flooding, so my editors asked me to cover some flood-related stories, which affected the cities of Jefferson and Fort Atkinson most drastically. Except half the stories I covered this week were other stories — stories that the flood did not have any affect on at all. Despite evacuated homes and businesses, there were other things people wanted to talk about. I’ll get to those in a moment. The floods had their own tales, which were stories for me to tell. Today I’d like to talk about credit. Not the kind of credit you need to buy a house or a car, but the credit that you see when you first open a book or watch a movie. Nope, I’m talking about the credits that typically come from working on a project either alone or with someone else. As I talked about earlier this week, I mentioned how important it is to look at the non-financial methods of how you feel validated about your writing. I think it goes without saying that this is a common desire for many writers, and I feel that there is a way we can help each other out. Giving someone else credit for the work they do is a great way of supporting your fellow scribe, because credit is free. In my travels to various conventions, I’ve met quite a few “B”-list actors and stunt folk that have been kind enough to explain to me what it’s like working on various sets. One of these actresses (who shall remain nameless for privacy reasons) once told me how she doubled for an “A”-list actress in a well-known action movie. For whatever reason, the “A”-lister proclaimed that she did her own stunts to the media, which is not an uncommon thing for actors and actresses to do. Unfortunately, in this case the claim wasn’t true but there was no appropriate way for anyone involved to go and correct the mistake. Years later, the stunt double still remembers the claim and (you guessed it) will probably never forget it. What did the “A”-lister do wrong? Over the course of this blog I’ve talked about Google Webmaster Central for bloggers, Why I Heart Feedburner and Google’s Blogger: Pros and Cons for Freelance Writers. Today I’m going to talk to you in very general terms about how I use the free web analytics tool called “Google Analytics” on my blog. Before I do, I’d like to offer that if you’d like to read up on Google Analytics there’s nothing like going straight to the source: you can read the Google Analytics Blog or the ROI Revolution Blog which is the company that performed the training I had attended. Second, web data is not like financial data no matter how many ways you slice and dice it. This means that while every penny may add up in your accounting software; not every visit will “add up” in web analytics so don’t get too obsessed over every, bitty thing. Since installing GA early January, I’ve been using it to track comparison trends and understand where my traffic is coming from. My goals for my blog are different than a website that sells stuff or offers rapid-fire information; I hope that my content will be useful six months, a year, or even five years from now. I do not have buckets of traffic where I have even 1,000 plus visitors every day. Another way my needs are different from other blogs, is because blogging is a way for me to explore more tools, stay on top of web trends, network, make announcements and offer you my experiences to “pay it forward.” I’m not blogging for dollars; if I was, you’d better believe I’d be doing things differently. Here’s an example of the comparison view graphs you can use to track trends in Google Analytics.